I got a stove that burns 13 min plus on 1/2 oz. fuel. 16 oz. water 1/2 oz. fuel 72F water 8 to 8-1/2 min. boil not roll but good steam. burn time 13-1/2 min. + now i did not bleave it myself so i did it 3 times and all the same. Maybe a little slow on boil but the burn time cant beat it. Last edited by oops56 on Thu Sep 27, 2007 2:28 pm, edited 1 time in total. I see a primer wick, do you have to prime it? Move the pot support so we can see the burner better. 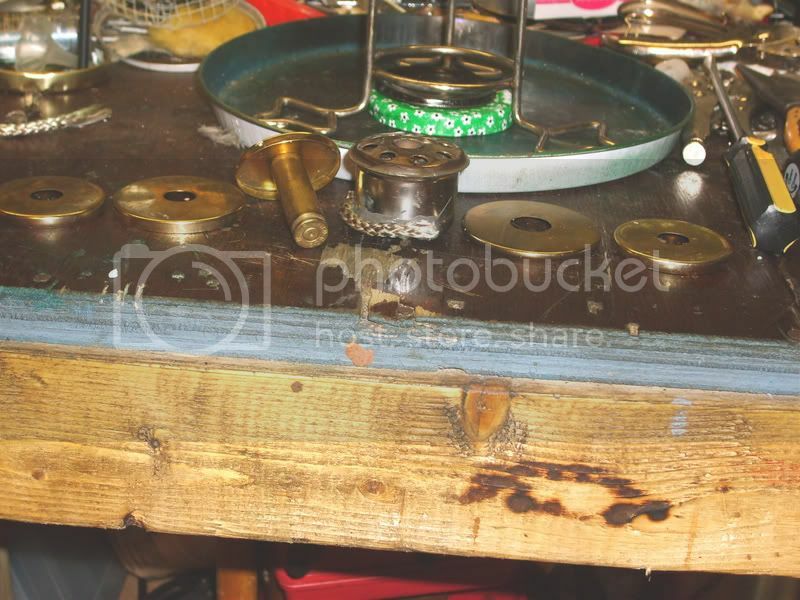 Looks like the green part is a jar lid and the stove is resting on it. 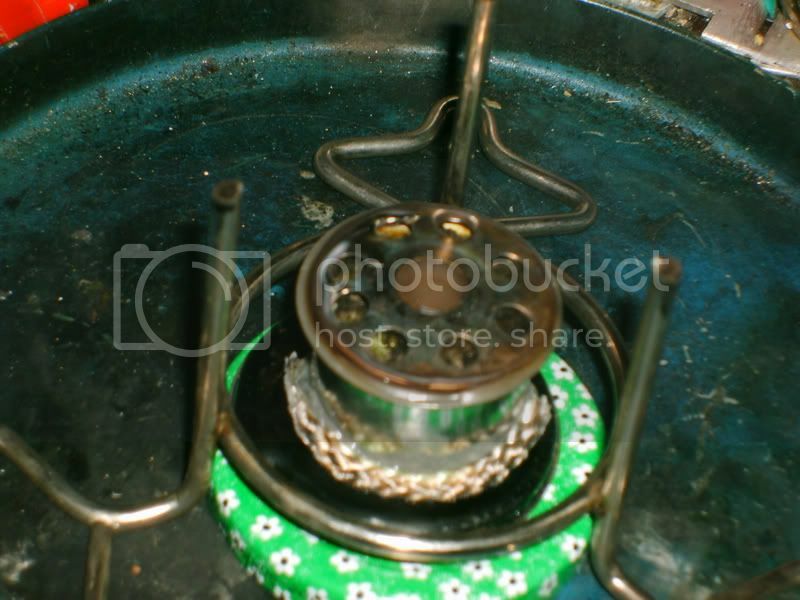 Skidsteer wrote: Looks like the green part is a jar lid and the stove is resting on it. I agree, I took a second look, looks like a Smuckers Preserves lid. You all are wrong the covers was to get my flame hight don't have pot stand for it yet i always try diff. hight tell i get it right. The top cover something i get at the hardware stove just has a middle hole in it 6 or 7 o d size. It does not need a prime wick but its a little slow with out it on start up wick is faster the wick is a little long half of it would work.The green on the wick is food coloring i put a few drops in my alcohol to see it better in the quart can fist. oops56 wrote: I got a stove that burns 13 min plus on 1/2 oz. fuel. What diameter is the candle cup holder? What caliber is the casing? What is the thing on top of the candle cup holder? The thing with 7/32 holes. What is going on there??????? I can't believe it either. Boils at 8 and continues for an additional 5 1/2 min on 1/2 ounce of fuel. Yikes!!!! that's fantastic. Nahhh!! you're pullin ar legs, right? 8-1/2 min. 200F steam lots 13 and 50sec. burn time o it stil had some more flame left but it was not doing much. Oops, you got yourself a great stove design there. That cast iron pan you carry around with the hole in it keeps your nose from growing We know you would'nt pull our leg. 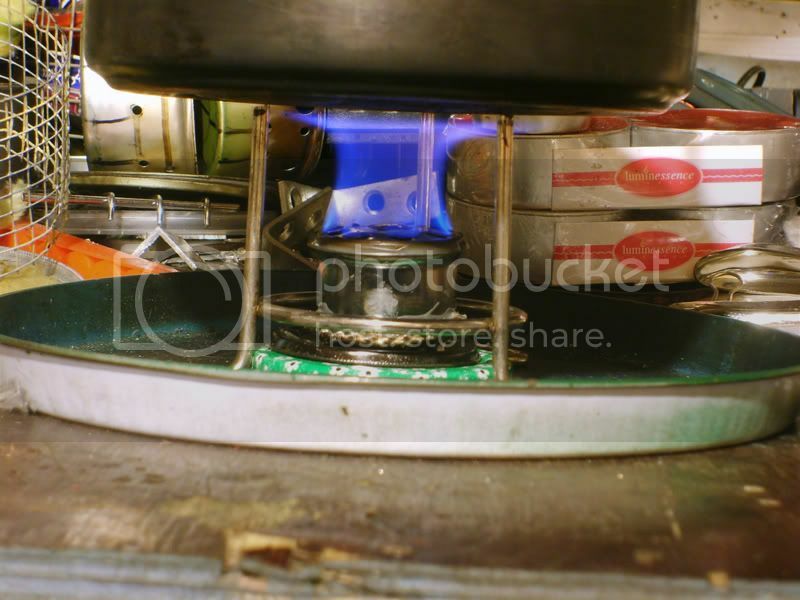 What would happen if you put the wick and 308 and the holy top on top of an aluminum tea candle tin(more heat transfer to fuel)? Would it stay lit and bloom by itself instead of having to use a primer wick? Again, great design!!!! Nice use of different parts. Thanks for sharing.